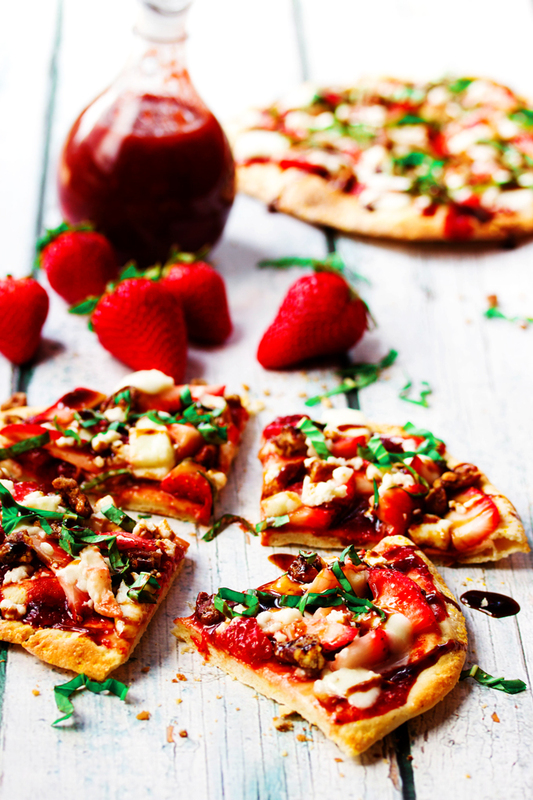 This strawberry pizza is fresh and light with sliced strawberries, fresh mozzarella and basil with a drizzle of balsamic reduction all on top of an easy homemade pizza crust. Its unique and sweet and savory and amazing. We have one of the most unique and delightful strawberry recipes I have tasted in a long long time! 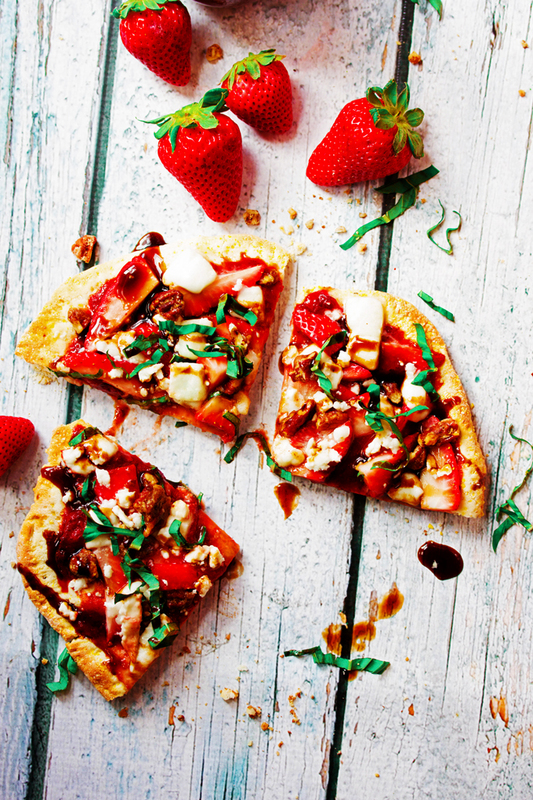 Strawberry Pizza! We don’t get fresh strawberries here until at least June, but strawberry season is in full swing in California and we are getting some pretty tasty strawberries in our stores these days. They are good, but they just build the anticipation for strawberry season in the Fraser Valley where we get strawberries in the markets that have been picked that morning. They are so juicy and fresh. Incredible! 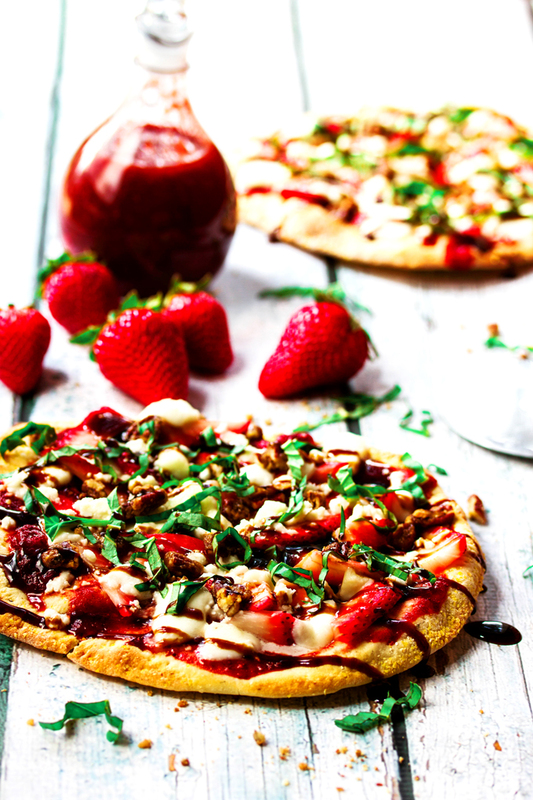 This strawberry pizza will be even more amazing when we make it in June or July. 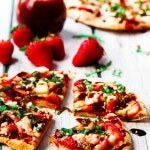 That said, this strawberry pizza is pretty irresistible now. It certainly has that WOW factor. 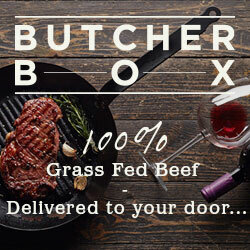 From the presentation to the taste, its an all round show stopper. Imagine you put this down in front of your guests at a dinner party or on the back deck with a bottle of wine… They would be all over it. Plus, its so easy! The hardest part is rolling out the crust. 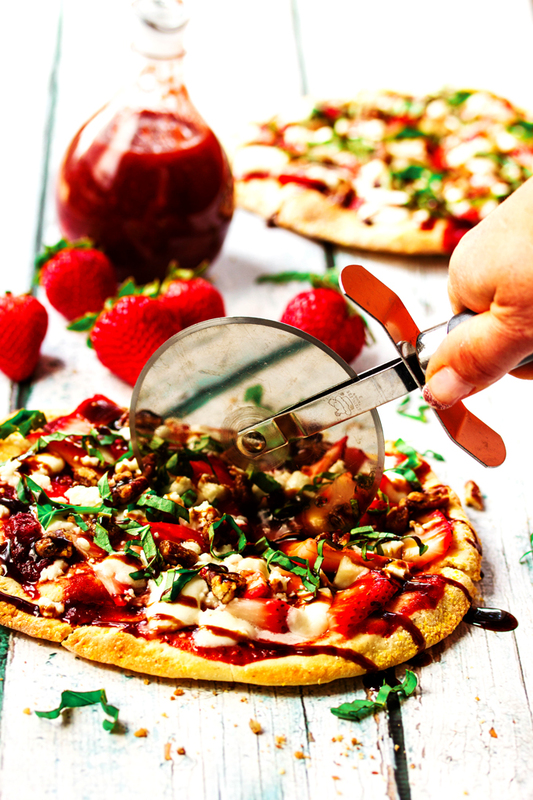 Thin , slightly crunchy crust topped with a sweet, homemade strawberry sauce, loaded with juicy strawberries, fresh buffalo mozzarella, maple roasted pecans, tangy balsamic reduction and finally sprinkled with a generous handful of fresh basil. Absolutely over the top incredible. Its one of those recipes that is outstanding from the first bite to the very last! Honestly, I can’t even tell you how good this is, you just have to try it. I wanted to eat this whole freeking pizza! Just looking at those pictures makes me want to get out my kitchen aid and make up a bowl of pizza dough. Since I have had it before, when I’m looking at it, I can taste it! If you love strawberries, or even just like them, get your own dang mixer out right now and just do it! In a measuring cup, add the warm water, honey and yeast. Set aside for 5 mins. In the mixing bowl of your food processor add the flour and salt and then stir. When the yeast mixture is bubbling, add the yeast mixture and 1/4 cup olive oil to the flour mixture. Mix on medium for about 5 mins until its well combined and the dough looks nice and silky smooth. If its to sticky add 1 tbsp at a time of flour or if its too stiff add 1 tbsp water at a time till soft and smooth. Oil the sides and bottom of another bowl with the rest of the oil and place the dough in it. Cover with plastic wrap or a towel and put it in a warm place to sit for a bit and rise. Let it rise/rest for at least 25 mins or until it doubles in size. Heat oven to 400 degrees. If you have a pizza stone, put it in the oven now to heat with the oven. Punch the dough down and break into evenly sized balls for your pizzas. You will need a ball the size of a tennis ball for an 8 inch pizza. Sprinkle a little flour and corn meal on a clean surface and roll the ball of dough out to your desired thickness. Place all ingredients into a saucepan and bring to boil. Turn to low heat and simmer till it thickens. This will take about 15 mins. Set aside to cool. First spread a thin layer of the strawberry sauce over the pizza crust. Add the fresh strawberries and buffalo mozzarella and a sprinkle of the feta. Place in the oven and bake until the mozzarella is melted. Remove from the oven and top with a sprinkle of pecans, chopped basil, and finishing salt. Finish by drizzling balsamic reduction over the pizza. Cut into slices and serve!